The Common Core Standards identify six instructional shifts necessary for effective implementation of the ELA/Literacy strand. These instructional shifts provide a framework to help us understand the big picture before diving into the specific individual standards. CCSS Shift 5, Writing from Sources, calls for an emphasis on analyzing and synthesizing information from multiple sources to reach a conclusion or make an argument. This type of writing requires students to construct knowledge through research and present evidence that is accurate, precise and clear. Regularly engaging students in this type of writing will foster the development of essential skills to help them succeed in college and beyond. It’s fairly safe to say that many teachers use the Halloween theme to launch creative writing activities that focus on stories and personal narratives. 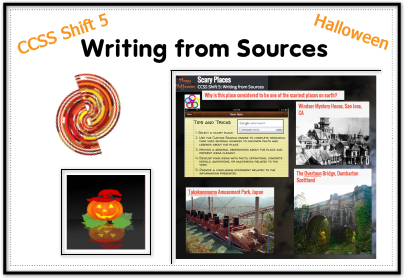 Perhaps with a little twist, teachers can take advantage of Halloween writing activities that focus on gathering information from sources through research to present information about haunted places, dispel or defend myths, and present conclusions that are based in fact to support the CCSS Shift 5. Explore a sample launcher for a CCSS aligned Halloween writing project that has been embedded here. An essential question can be a very effective tool for guiding research and tapping into students’ enthusiasm for inquiry and learning. These questions provide students with challenges that allow them to invest in the learning process as they make decisions about their own learning. Since essential questions do not have one correct answer, students can choose flexible learning paths to find success and demonstrate learning. A topic like this could send students on searches that lead them to questionable websites. A traditional work around might be to publish a list of acceptable websites for students, but perhaps a better solution is to create a Goggle Custom Search Engine for use with this type of project. Searching involves critical thinking and it is an important skill that needs to be taught. The Goggle Custom Search Engine Tool allows teachers to easily build your own search engine that is customized with content you choose to be appropriate for your grade level or for a particular unit of study, This tool provides teachers with the ability to bring relevant and reliable sources into the classroom while also teaching students how to conduct a search and it can be embed into any blog, wiki, or site for easy access. Padlet is the tool I used to launch this project. It is a free tool that allows you to create an online collaborative board of online sticky notes for use in the 24/7 classroom. In addition to text, the notes can include images, links and videos. One of the best features about Padlet is that students do not need an account to log in, making it an efficient and useful tool for a variety of learning tasks. To make sure to cover specific writing and research standards for your grade level, consider creating a rubric with the guidance of the Common Core App by Mastery Connect. Use the app for quick and easy access to standards that are presented clearly and provide snippets of relevant information without overwhelming. With the information at hand, you can fine-tune the learning experiences to target many specific standards in one project. If your school is using Google Docs, there are plenty of opportunities for students to collaborate, brainstorm, write, research and publish their work. Use the document for written papers or try the presentation to express learning in a multimedia format.